Opportunity lures all immigrants but this one might surprise you. John Abercrombie comes from a land down under. Immigrants have long sought America’s bounties. The Pilgrims came for religious freedom. Countless others came for work. And John and Alison Abercrombie came for the abundance of hydraulic hoses. In fact, they sold their home, packed up their two children and moved from Wollongong, Australia, to Houston because of those hoses. It’s a story that begins at the Abercrombie family hydraulics-services company in southern Australia. John’s father sold the business, and then John and Alison continued to work there while looking for a shot at controlling their own destiny. 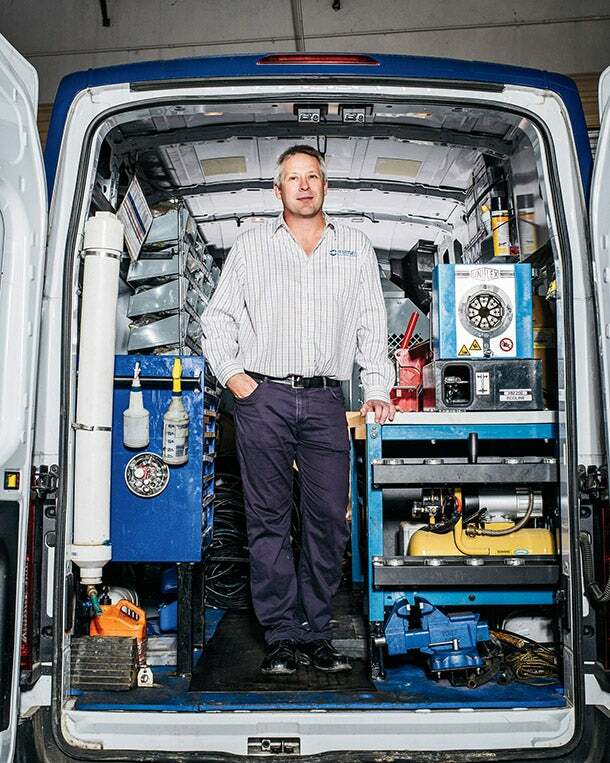 John was attracted to Pirtek, an Aussie-based mobile franchise that fixes hydraulic hoses on equipment like excavators at work or construction sites, but it turned out that the brand was already well-established throughout Oz. And yet! The company was eager to expand into the U.S., and John was game to help, so off the family went. Last January he opened a Pirtek unit in Houston. Is Pirtek that good of an opportunity that you’d move halfway around the world? We knew we wanted to own a franchise business. That was clear. We wondered what we could do in Australia, and it came down to running a chicken-wings shop or something like that. But from my [former] career, I was very comfortable with Pirtek and saw the potential it has in the U.S. And to be honest, having an adventure and resetting our life was appealing. We compared it to wiping a whiteboard clean and designing things anew. Was it difficult to get a visa to move to the United States? It’s a terrifying process. From start to finish it was five or six months, and it all depended on walking up to a counter at the U.S. consulate and praying that the gentleman behind it accepted our application. If he didn’t, we had no plan B; we had already quit our jobs [at the hydraulics-services business] and sold the house. It was extremely stressful. Why Houston? How’s it going? We looked at Charlotte and Las Vegas. But our family felt most comfortable in Houston. It’s just a massive opportunity; there are an incredible number of hydraulic hose users. So far, we feel we’re fitting in well. We came from a city of 300,000. Houston has seven million. It was quite a shock to see the freeways and get used to traffic. It’s the small things that drive you nuts -- like paper checks. In Australia, I hadn’t used a check in 15 years. Here they are standard, and people still use fax machines quite a bit. But the biggest difference is employee skills. Australia has a very strong technical training system where technicians would have done three to four years of college and had an apprenticeship. Not so here. We really have to watch to spot people who are technically competent versus people just saying they are to get a job.